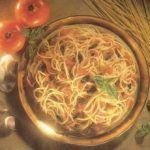 “I think oven-dried tomatoes make the best spaghetti sauce in the world.” Francesco prefers to oven-dry regular round tomatoes, not the oval plum or Roma variety, which he finds can taste too aggressive and overpower the pasta. “I also like the bright flavor of this pasta better without cheese, which adds a pungency it does not need,” he says. “You should not automatically put cheese on every pasta; it depends on the flavors.” This pasta can be served hot or at room temperature. Bring a large pot of water to a boil, add salt, then add the spaghetti. Cook until it is al dente, about 8 minutes, then drain it well. 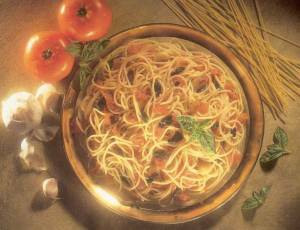 While the spaghetti is cooking, combine the tomatoes, garlic, and olive oil in a very large, heavy skillet. Cook over medium heat a few minutes. Cook over medium heat a few minutes, then add the drained spaghetti. Toss the spaghetti and tomatoes together for several minutes, add the basil, season with salt and pepper, and add the hot red pepper flakes. Remove from the heat, add a little more olive oil if desired, then serve.